I'm Mr. Meeseeks, look at me! In the first season of Rick and Morty, Rick is looking to get his family off his back, so he presents them with a Meeseeks Box, a gadget that has a big blue button on top; pressing the button summons a Meeseeks, an extra-dimensional creature created to help its summoner perform a task. When the task is complete, the Meeseeks disappears in a puff, unmade from reality. 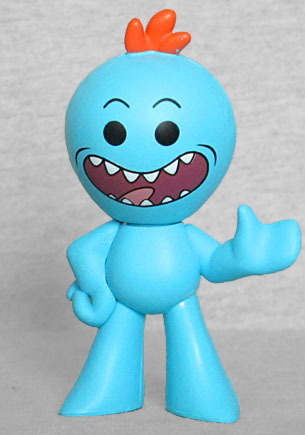 Mr. Meeseeks is one of the most iconic creations of Rick and Morty, so of course he was included in the first series of Mystery Minis. The body is pale blue, though the proportions seen in the cartoon don't translate super well to Mystery Mini form: animated, they're tall and gangly, but as a toy, he's short and squat. The Rick and Morty Mystery Mini are the kind with painted faces, not big blank eyes. I like the blank ones better, but hey, your preferences are up to you. Mr. Meeseeks has a big wild smile on his face, showing off his pointy, rounded teeth and a lolling tongue. There are wrinkles painted around his mouth, and his eyes are solid black dots. Thank goodness for that - Rick and Morty is a great show, but the fact that the characters' pupils all look like the urethra on Michelangelo's David really bugs me. Like, oh my god, just draw a damn circle! 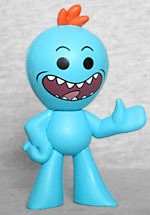 Mr. Meeseeks is not one of the most common figures, available in a 1:24 ratio (or every other case, in other words). But if you really want to build a collection, you'll also want to check out Target and Hot Topic, who each get their own exclusive versions. While the normal Meeseeks is bright and happy, the exclusives each show Mr. Meeseeks after several days of failing to improve Jerry's golf score - they're dirty and haggard and ready to die. 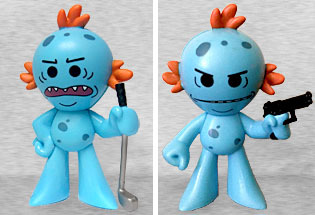 Hot Topic Meeseeks has bags under his eyes, an exasperated frown on his face, and is holding a golf club; Target Meeseeks has his mouth mostly closed, and is armed with a pistol. Both of them have three tufts of hair to the normal figure's one, and are painted with dark spots on their skin. And they're both 1:24, as well, so there's no guarantee the store-exclusive boxes will even have them, which seems like a real "Jerry" kind of move. This entry was posted in blog exclusive review, Funko and tagged Adult Swim, Mystery Minis. Bookmark the permalink.